Do you sometimes find yourself in a supermarket or delicatessen holding a new-to-you ingredient in your hands, maybe even a quite pricey one, pondering whether to buy it or not and asking yourself how often you are likely to actually use it before it will go off? Admittedly I try not to let such rational thinking interfere with my buying what are surely the key constituents of future delicious food. But then the other day Alessandro decided the day had come to find a new home for all our pasta. I counted and we currently have over 10 different shapes of pasta – that might seem a lot to most people but is in fact fairly modest to what I have seen at some friends’ places here in Italy. While the door of our pantry still closes without forcing it shut Alessandro could be right in saying that my baking supplies have taken over our pantry. As much as I like having 7 different types of flour to choose from, 6 different types of sweeteners and spare supplies of baking soda, baking powder and instant yeast I bring over every time I go back to London (and that is before we even get started on my pantry’s ample supply of dried fruits, nuts, seeds, gelatin, agar agar etc), it probably isn’t necessary to have all of this on hand at all times. While I am not ready to give up on a well-stocked pantry to fuel my baking experiments nor to dial down my enthusiasm for buying random new-to-me ingredients, the hunt for a new home for our pasta, safe from any open bags of flour ready to tumble over at any moment and dust everything within their sight in a silky white blanket, was a good reminder to not just stock our pantry full of delicious, intriguing, unusual and rare ingredients until it bursts but to try and make the most of these wonderful ingredients and avoid having any ingredients that get used once before being banished to the back of the pantry where they die a slow death until they are past their expiration date and get thrown out. Luckily, the sumac and pomegranate molasses I bought for a Turkish recipe are not facing the same fate. 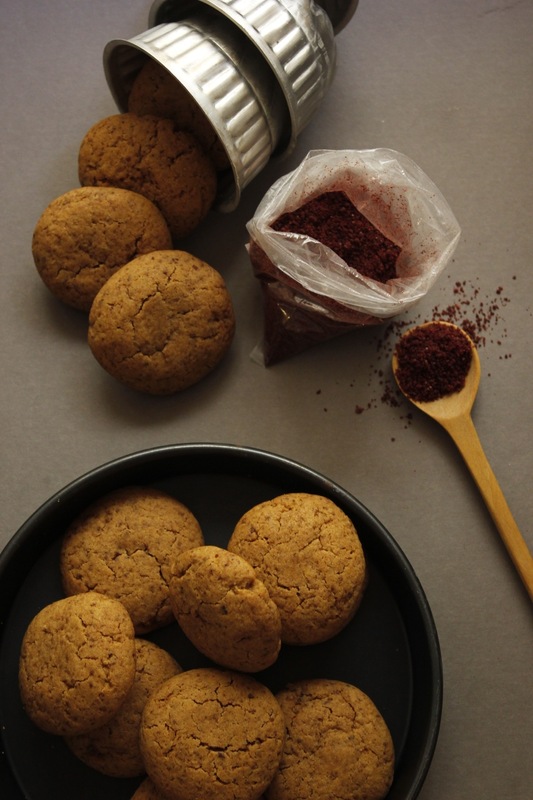 Not only is the pomegranate molasses a great addition to many Middle Eastern dishes and cocktails, together with sumac they form the flavour base of a damn fine spiced cookie. 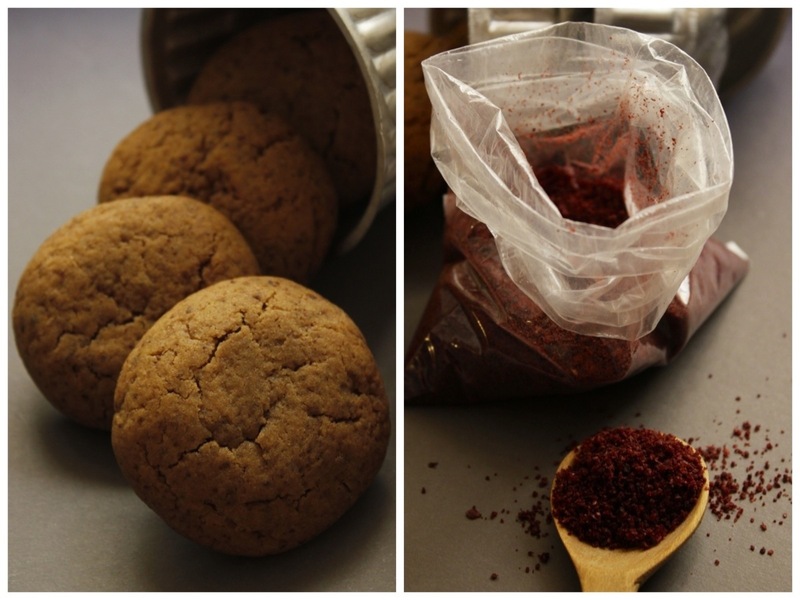 Their closest cookie cousin I could think of is a soft gingersnap cookie although these cookies do away with ginger and instead are heavy on the cinnamon and the allspice. 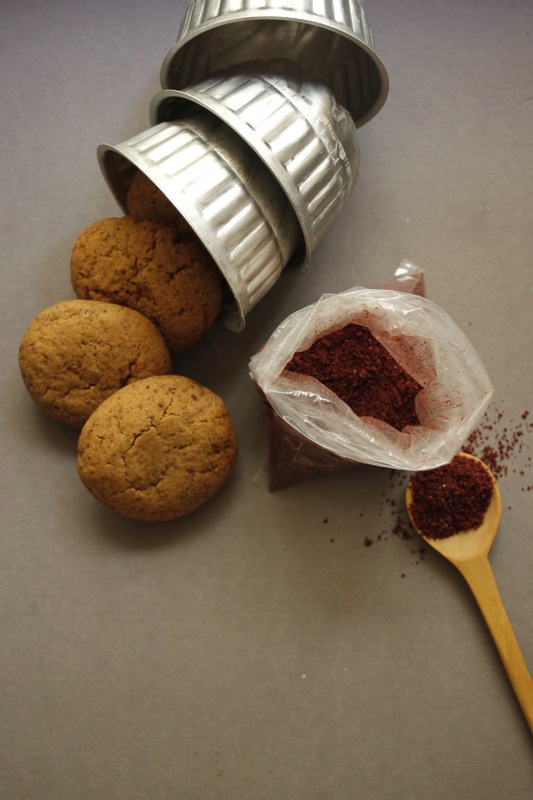 The end result is unique – sumac is a pretty tart spice and although the pomegranate molasse is certainly sweet it is at the same time tart – what you get is a soft and chewy cookie whose flavour is best described as fruity and spiced, not unlike mulled wine. 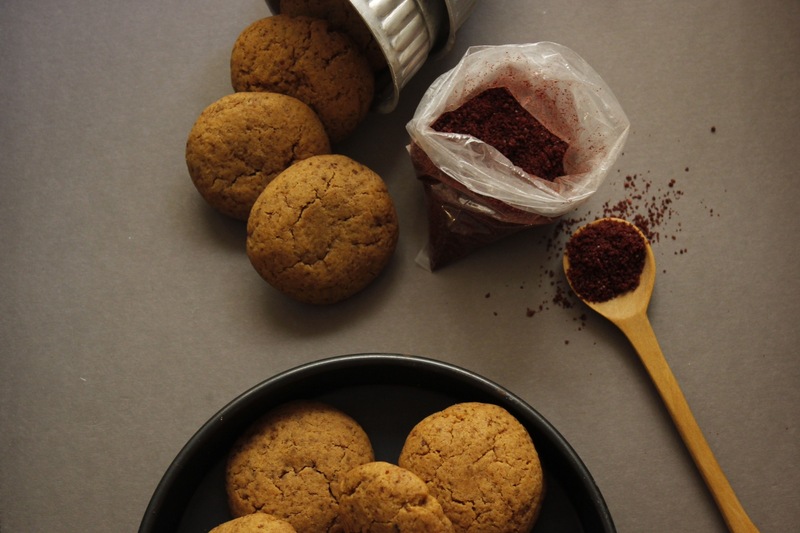 Note: Sumac is very tart and the raw dough will seem very tart – this mellows out after baking leaving the cookies with a fruity flavour. That being said, you can always reduce the sumac to 1-2 teaspoons instead. 1. Start by beating the butter together with the brown sugar using an electric whisk until light and fluffy (this should take between 5-10 minutes). Add the pomegranate molasses and the egg and beat for 2-3 minutes to combine. 2. In a separate bowl whisk together the flour, baking soda, salt, cinnamon, allspice and sumac. Dump into the bowl with the butter mixture and stir quickly to combine. Cover the bowl and place in the fridge for a minimum of 2 hours or overnight. 3. When ready to bake pre-heat the oven to 180 degrees Celsius and line a baking sheet with parchment paper. Take lumps of dough the size of a heaping tablespoon and roll them into balls, place onto the prepared baking sheet and flatten slightly with the heel of your hand (so each cookie is ca. 1 cm in height). 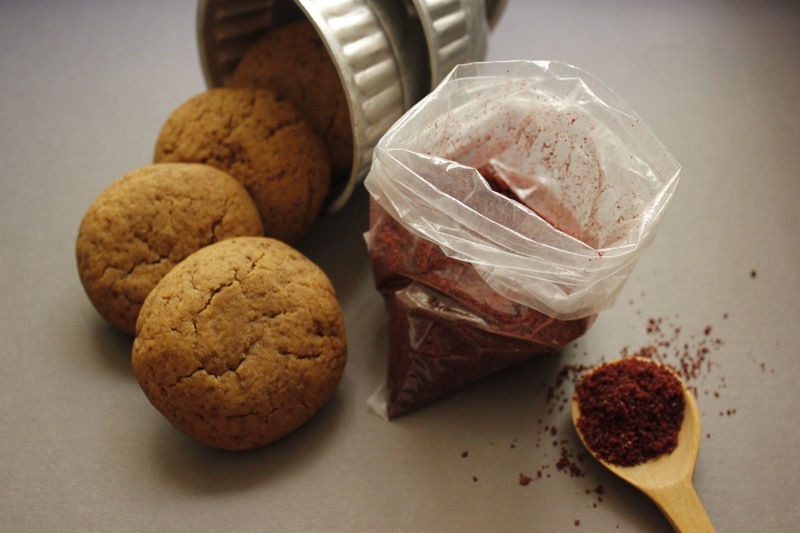 The cookies won’t spread much while baking so you should be able to get all cookies baked in 2 batches. 4. Bake cookies for 10-12 minutes until light brown in colour and the cookies have puffed up a little. Let cookies cool for 2-3 minutes before carefully placing them on a cookie rack to cool (they will seem quite soft at first but will firm up as they cool). I think that sounds like a very sensible number of different pasta shapes 🙂 And these cookies look fab – hurrah for varied and interesting ingredients! Well you would not want to pair your delicious pasta sauce with the wrong pasta shape, right? 😉 And yes, it’s all about varied and interesting ingredients, makes life/eating more exciting! I would love to try out sumac and I really should have bought some when I visited London a year ago…since it is not easy to find. And I share your problem, I too have way too many interesting things in my pantry waiting to be used! It sounds like you are somewhere where it is somewhat difficult to track down certain ingredients – I feel your pain, Rome isn’t too bad but does not compare to London. I think I shall make it my new year’s resolution to develop recipes with some of the more random pantry items that never get used! What a lovely and unusual combination of flavours in these cookies – I have similar ingredients floating around in my pantry and I must get better at using them up! Thank you Kathryn! I should be better at that as well but sometimes I just forget. Spring cleaning / moving house is when I usually realize just how well stocked my pantry actually is, ahem. What an interesting use for sumac! I picked some up in Jordan recently, and I’m encouraged that it must be possible to find all the other ingredients in Rome. I will have to try before the holidays! Thank you! If you have any trouble finding the ingredients, I got the pomegranate molasses from Castroni – not the cheapest place to shop but at least there are several central locations and they have a more or less decent choice of foreign ingredients. For spices again I either head to Castroni or to the Emporio delle Spezie in Testaccio (where I found the sumac). Another great place I just discovered is Selli International Food Store, just a few doors down from Regoli, close to Piazza Vittoria – better stocked and mostly cheaper than Castroni.